There have been three major performers who have played the title role in the 1954 musical adaptation of Peter Pan on Broadway. The original and most iconic was Mary Martin, who won a Tony for it and famously played the part on TV three times. Twice it was presented live (and kinescopes exist), but the third was taped in color in 1960 for future broadcasts which forever cemented the show’s (and Martin’s) popularity. Then in the 1990s, gymnast Cathy Rigby played the role in four separate Broadway engagements (earning a Tony nod for the first time out in 1991), took the show on numerous tours and also preserved her version for TV. In between these two, there was a major Broadway revival in 1979. 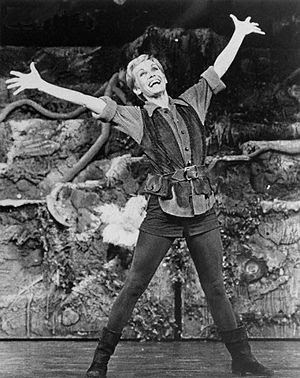 Sandy Duncan played the title role, with George Rose as Captain Hook. The show played the Lunt-Fontanne for 554 performances making it the longest Broadway production of this vehicle (to be fair, the other four engagements were all limited). An Omnibus TV special taped live during a performance at the Lunt-Fontanne presented “I’m Flying.” It’s really incredible to see the effect the show can have on children, and just how enthusiastic they get into the show especially when Peter is flying. Previous Previous post: Catching Up – Fela! & Yank!